The Nokia C7 has officially arrived, with the handset available for pre-order sim-free for £389. The Nokia C7 brings a sleek 10.5mm chassis, offering a mid-range touch-screen phone that is likely to be popular. 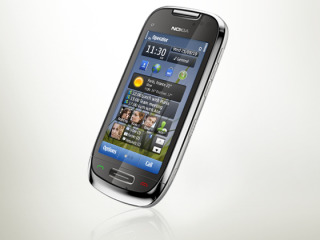 The C7 packs Symbian^3 and offers a 640x360 OLED screen with 8GB of storage. "The Nokia C7 combines classical Nokia design, with all the functionality you would expect from a modern smartphone," asserts Nokia. Then phone will be shipping from the Nokia Online Shop from 25 October and from The Carphone Warehouse, O2, Phones4u, Three Mobile, Virgin Mobile, Vodafone, and T-Mobile (offering an exclusive black limited edition) from November 1. "The Nokia C7 combines beautiful design with loads of great apps and powerful media tools, it really brings social networking to life at the touch of a button." says Sami Lehtinen, General Manager at Nokia UK.